When you are on camera there are things that you need to consider that you never would have thought mattered before. The truth is – they didn’t, but now they do. Like what to, or what not to wear when your on camera. Yes, you’re reading a “fashion” blog from an AV company. Go ahead, pinch yourself, it’s really happening. 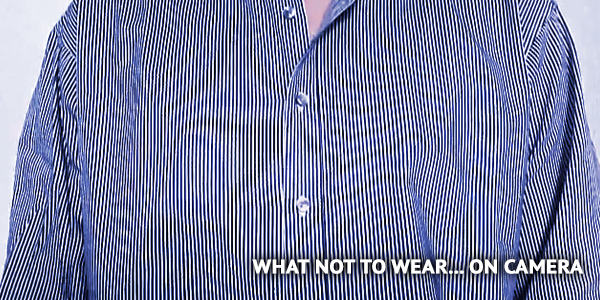 Don’t wear shirts, pants, or anything that has tight stripes for the pattern. Unless, of course, you are perfectly fine with looking like a walking, talking optical illusion to the people viewing you on the screens. This illusion is caused by two patterns interacting with each other to create a third pattern. The first is the shirt you shouldn’t be wearing, and the second is the pixel pattern on your digital TV. Think of a barber pole. Instead, try wearing a shirt with a bigger plaid design. This one should be pretty obvious, but it is still important to point out that if you have a black backdrop, don’t wear a black shirt. Unless, of course, you’re cool with looking like a floating head with an electric personality. Most cameras will not be able to disassociate the two black objects (your shirt and the backdrop). So, it’s best to just avoid the situation altogether. You still want to stand out on camera, but try to do so with your personality and content rather than a distracting wardrobe.